Interstellar Rodeo in Edmonton got off to a shaky start, delayed by a prairie storm, but even NASA has to take a rain check when it comes to weather. When the festival finally got off the ground, the crowd were eager to launch into cosmic festival mode. After short sets (due to the storm) from Jesse Jams and the Flams as well as Ruben and the Dark, A Tribe Called Red started as inauspiciously as the festival itself. 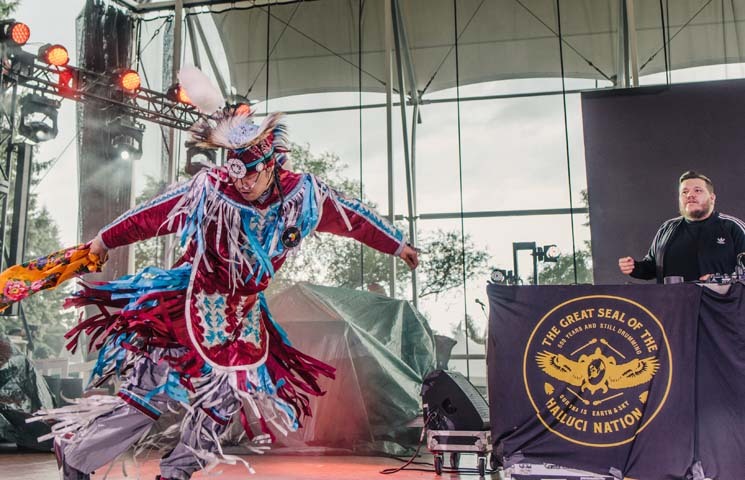 Quickly though, a fast build of beats and electronic drops mixed with First Nations' traditional singing, hip-hop and dancehall began a set that transfixed the soggy crowd. As A Tribe Called Red's set built, dancers hit the stage to utterly mesmerize the crowd, stirring the pond of soaked people into a frenzy that sent water whipping from wet hair in every direction. The relentless beats, densely packed samples and intense breakdancing were akin to taking a swim through a sonic torrent. At some point, without anyone really realizing it, the power of the flow carried the crowd into the deepest, most turgid part of the set. The only thing anyone could do is let the tide rush over them until the last pulsing beat from the Halluci Nation returned them to solid ground.